Ugh…it’s rainy and cold outside. 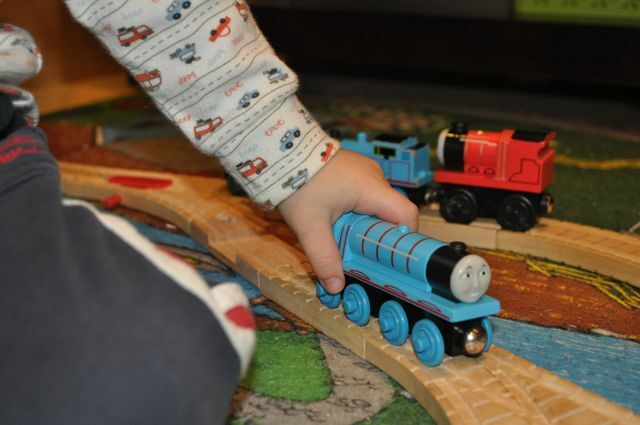 Winters can be long and cold here in Pennsylvania, and I have had to get more creative with fun activities for my toddler, Gabriel, since he isn’t interested in crafts at all and needs physical and tactile activities. Maybe he will like them more as he gets older (he’s just 2 1/2 now). I really hate schlepping two kids out in the rain to go places, so we usually stay at home and make our own fun. So, here’s how we spend our rainy/cold days! We set up his Thomas the Tank Engine Wooden Railway set and go to town imitating the scenarios he sees on the Thomas show. This activity he also loves to do by himself – added bonus! What kid doesn’t like play dough? 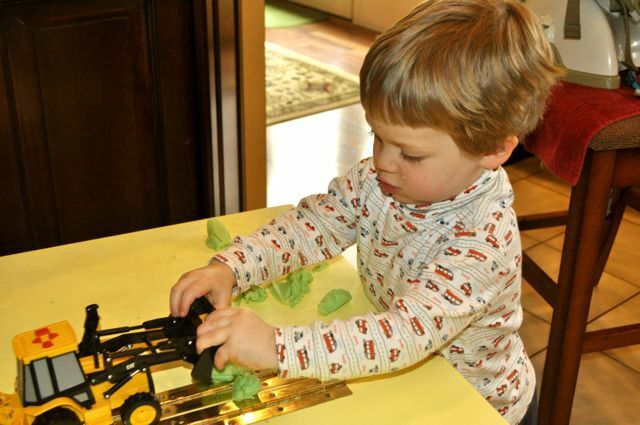 Gabe especially loves to use his digging toys to manipulate the play dough. I also like to give him a plastic knife and a bowl, and he pretends that he’s cooking dinner. It’s so cute to hear him repeat the things I say while cooking! This play dough was made at my friend Valerie’s house. She has an incredible blog about frugal kid crafts and activities! I’ve found that homemade play dough is so much easier for kids to manipulate and it stays pliable for very long. 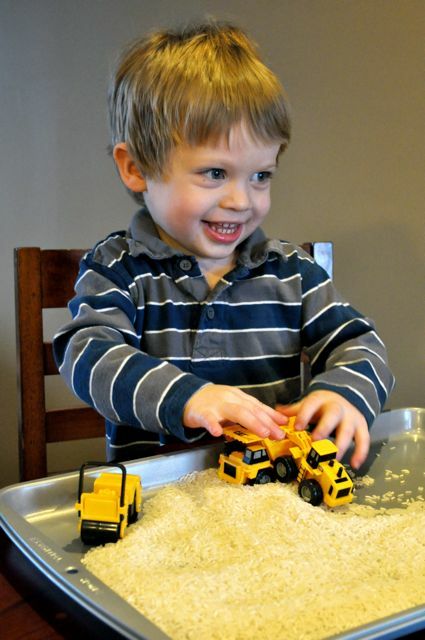 Fill Up a Cookie Sheet with Rice or Beans and Dig! We recently got this idea from my aunt and it has become a new favorite! We fill up a cookie sheet with rice (I buy the cheapest, biggest bag at the grocery store) and Gabe gets all his digging toys and digs and dumps. There is a bit of clean up here, but it’s not messy. You just need a stick vac and it’s clean in a few minutes! 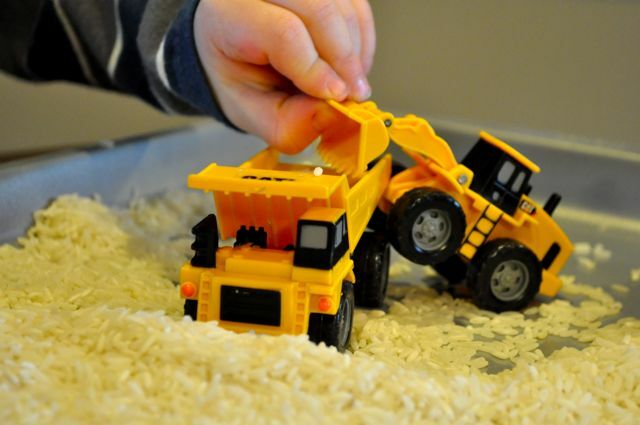 Another idea that I did last winter is to fill up a baby swimming pool with rice or dried beans and keep it in the garage for the kids to play in it like a sandbox! 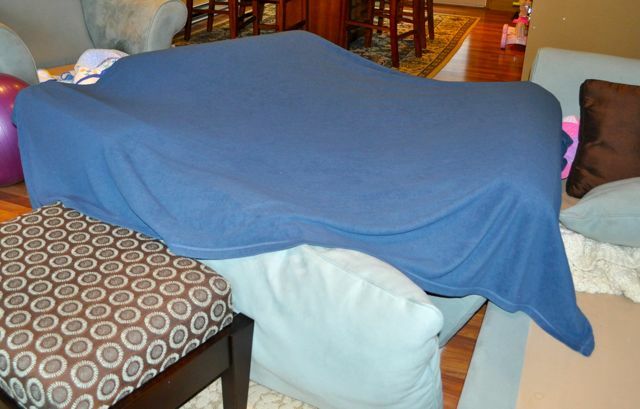 We love to build forts out of the couch cushions and blankets we have in the house! 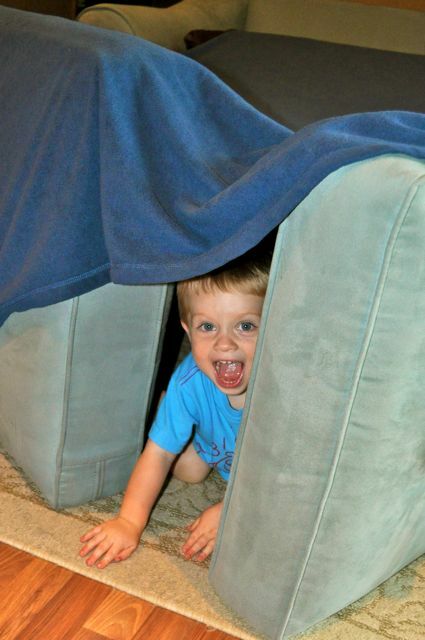 Baby Grayson gets so excited when Gabe and I do this and crawls around inside the fort, watching his brother run around and play hide and seek! We had bought Gabe a tent and tunnel for Christmas last year and very seldom does he play with them – he’d rather destroy the couch! 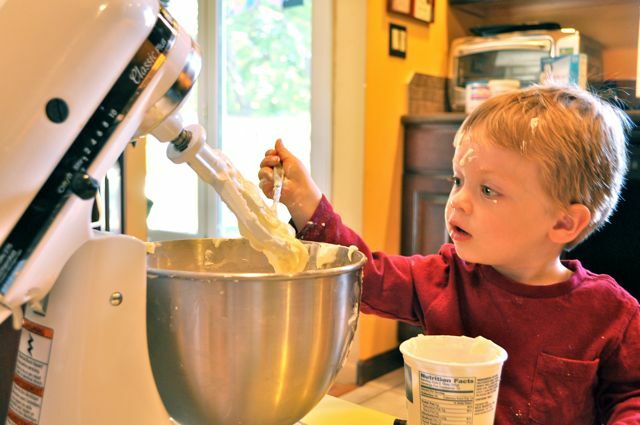 Gabe just loves to bake and cook with me. We started doing it together when he was about 18 months old as a way to keep him happy while I cooked dinner. It does get messy, but I’m not afraid of that! We have way more fun when I just relax and forget about the mess. 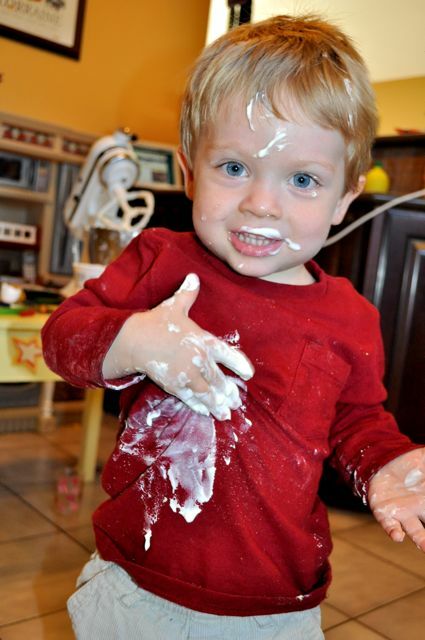 Gabe is then able to really get his hands to work and it becomes a full sensory experience for him that he LOVES. I also turn it into a math lesson to teach him numbers and fractions, all while bonding at the same time. I know these are times I will look back on with great fondness.